Nothing beats getting out on the water with your stand up paddle board, but it can be a long and tedious journey to actually get there. When you think about everything you have to pack up just to ride and strapping down your bulky board to the car or carrying it by hand, it?s enough to put you off entirely. Imagine owning a board where all the hard work was taken out of it for you, and you could simply get on with doing what you love best in the water. 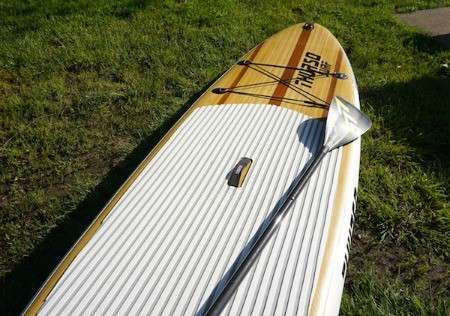 Inflatable stand up paddle boards can offer this to the modern rider, provided you can find a brand that?s made tough and durable to the standards of premium quality hard boards. 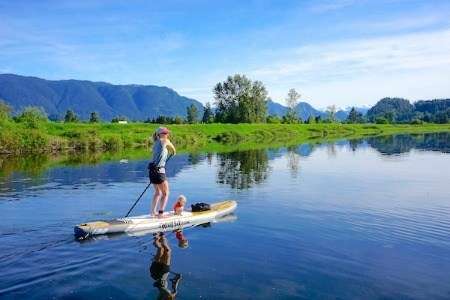 The Thurso Surf Inflatable Stand Up Paddle Board might be just the thing you?re looking for, offering a convenient way to enjoy your favorite hobby. This board is inflatable, lightweight, but extremely durable, so you don?t need to worry about how well it?s going to perform on the water. If you?ve been considering investing in an inflatable stand up paddle board and enjoying all of the features that this type of board has to offer, the Thurso Surf will tick all of your boxes and more. This is a quality made board backed with the guarantee of a reputable brand, so you know you can put your faith in it to perform to your standards. Thurso Surf do one thing and they do it well, and that is to create stand up paddle boards. 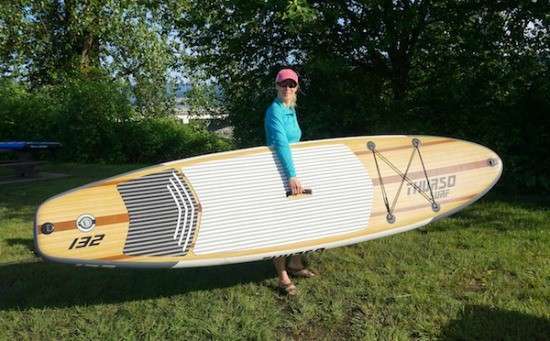 Their inflatable stand up paddle board is by far their best seller, and so much so that it can be hard to find one available to purchase these days. This is a board that has everything you need in the one package, so you won?t need to worry about getting different bits and pieces to enjoy it. 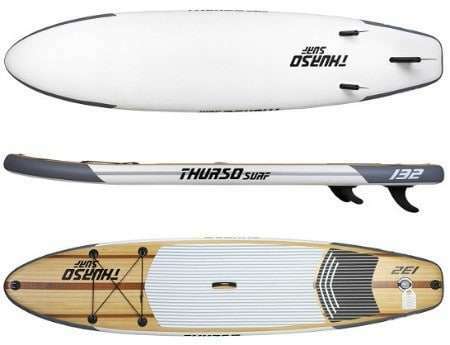 The Thurso Surf Inflatable Stand Up Paddle Board is best suited to lakes and rivers, but there?s no stopping you from taking it into the ocean. Not only will you get everything you need to jump straight into the water, but Thurso Surf has also included a durable backpack to keep it all in. There?s literally nothing else to buy when you invest in this inflatable SUP, so it?s an affordable way to enjoy your new favorite pastime. As one of the more affordable inflatable stand up paddle boards, you might be surprised with just how durable the Thurso Surf model feels. This is capable of performing just as well as a hard board, and without the heaviness or drama it takes just to strap it onto the car. You can literally throw it in the backseat and use the high pressure pump to set it up as soon as you get to the water. 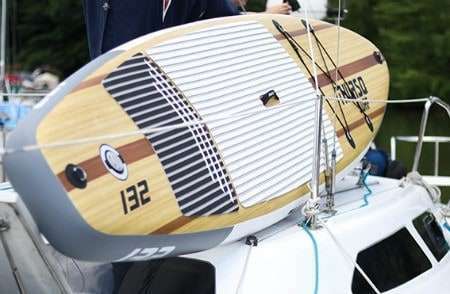 The only real negative about this board is the paddle that comes with it, as some reviewers have remarked that the blade can be a little flimsy. If you?re interested in upgrading your paddle this might be an option, however, for those who aren?t too concerned with a heavy duty paddle will find it does the job just fine. The Thurso Surf Inflatable Stand Up Paddle Board can be hard to get your hands on, so the best way to find it is through Amazon. Not only do they have it stocked more regularly than other places, but they also offer a huge discount with over a third of the cost off. This board costs around $700 to purchase which makes it one of the more affordable styles, and when you purchase through Amazon they?ll also send it you for free. If you?re a lucky member of Amazon Prime, all you?ll have to wait is just two days before your new Thurso Surf board is at your doorstep and ready to take down to the water. Thurso Surf is so proud of their products and has absolute faith that they are durable and reliable, so all of their stand up paddle boards come with a full two-year warranty. You?ll be hard pressed to find this on other boards, and this alone should be a testament to just how well made the board really is. With so many inflatable stand up paddle boards out there, it?s nice to find that the Thurso Surf Inflatable SUP truly stands out in terms of quality and strength. Thanks to the durable, military grade PV this board will look brand new for years to come and it?ll be a very long time before it needs replacing. 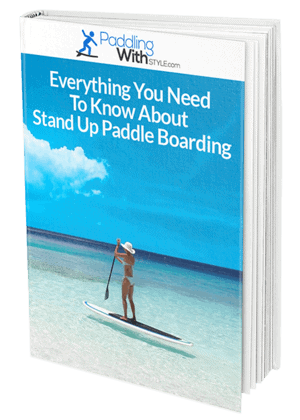 If you?ve been waiting for the chance to upgrade your paddle board to something innovative, convenient, and reliable, the Thurso Surf Inflatable Stand Up Paddle Board is the one for you. To get one for yourself and feel the difference that a quality inflatable board can make.